I for one can say its been a bad year for bitting things. With a couple of weeks in Scotland and weekends in the Lakes, North Wales, Isle of Wight, Peaks….. the common thread has been the need to protect myself against biting things. Given midges, mozzies and all manner of bitting creatures are attracted to CO2, running really can be a pain when getting on a trail littered with flying carnivores. Lifesytems have long been a later and pioneer in insect repellents and I’m fortunate to have their full range at my disposal. Below are 2 ways they can keep them at bay and a final option for if a sly ninja breaches the defences and feasts. 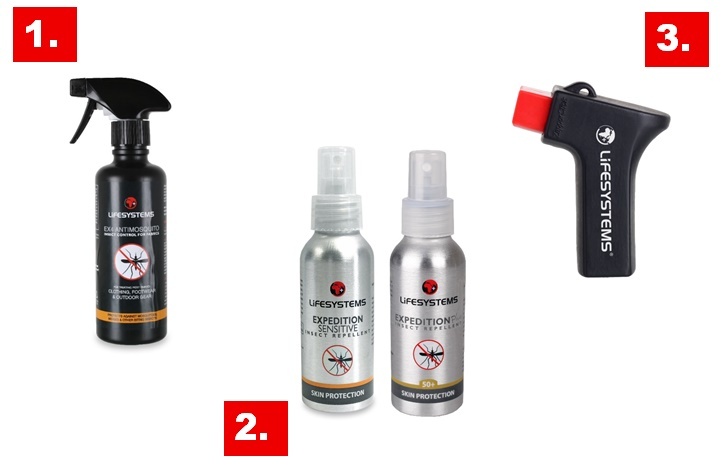 Lifesystems offers protection and treatment from biting bugs in 3 easy steps. Your clothing is the first barrier against biting bugs but why not turbo-charge its protective qualities by treating garments with Lifesystems’ EX4 Anti-Mosquito Spray. Easy to apply onto all types of clothing, sleeping bags, tents and mosquito nets, EX4 Anti-Mosquito comes in a handy spray bottle that can treat up to 3.5m2 of fabric. The treatment has been developed using the active ingredient Permethrin, a highly-rated insecticide that kills ticks, midges and mosquitoes on contact. Although fatal to insects, the chemical has no side effects for humans and lasts for several washes. Keep ticks, midges and mosquitoes at bay while walking or camping by regularly applying a high-performance DEET or non-DEET based insect repellent to exposed areas like the ankles and wrists. For everyday use in low-risk areas, Lifesystems’ advanced Expedition Sensitive is a great DEET-free choice and can be used by the whole family. Created using Saltidin as the active ingredient, the repellent offers 8 hours of effective protection. Alternatively, Lifesystems’ bestselling Expedition 50+ repellent contains 50% DEET for proven and reliable protection against biting bugs in a wide range of conditions. Easy to apply, both repellents are supplied in Lifesystems’ signature, durable and leak-proof, aluminium pump spray bottles and are available in several sizes including a pocket-sized 25ml option for topping up your protection on the go. If the worst happens and you do get bitten by a midge or mosquito, instantly alleviate pain or itchiness with Lifesystems’ nifty Bite Relief Click gadget. Easy to store inside a pocket or first aid kit, the Bite Relief Click uses a Piezo crystal to release a low-level electric charge to the area. Simply click the affected area around 5-10 times to localise the poison and inhibit your body’s histamine release (this is what causes the itchiness!). This helps to soothe any discomfort and reduces swelling and inflammation. Each Bite Relief Click can treat around 1,000 bites.